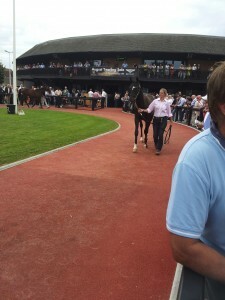 14.091.000. euros 50% increase on 2012 for the opening night of the Deauville Intl Yearling sales organised by Arqana. 2 future race horses selling for a million euros……..
14.091.000. euros , a 50% rise on 2012 first evening auction figure, at the Yearling sales 2013 opening. For the 1st evening of the Deauville Intl Yearling race horse auctions organised by ARQANA 6 Lots went for 600.000 euros.11 Lots for 400.000, & 22 Lots over 200.000 euros. 75% of the Lots offered were sold. Amazingly, 2 yearlings realised 1 million euros. Lot 14 presented by the Irish Ballylinch Stud was bought by the Agents Peter & Ross Doyle Bloodstock. And after a tussle David Redvers was the highest bidder for Lot 33, presented by Ecuries Monceaux, on behalf of M.V Magnier & Coolmore. Lot 33 being the 3/4 sister of Chiquita. The top 5 buyers were Peter & Ross Doyle 4 Lots, for 2.340.000 euros John Ferguson Bloodstock 5 Lots for 1.650.000. euros Mandore Intl Agency 3 Lots for 1.210.000. euros Michael Vincent Magnier 2 Lots for 1.150.000. euros Oceanic Bloodstock INC 3 Lots for 780.000. euros. The top sellers were Ecuries Monceaux 10 Lots for 2.710.000 euros Haras des Capucines 10 Lots for 2.610.000. euros. Ballylinch Stud 1 Lot 1.000.000.euro Haras du Mezeray 2 Lots for 940.000. euros. Haras d’Etreham 6 Lots for 905.000. euros. We note that Badgers Bloodstock acquired Lot 93 from Oaks Farm Stables, paying 128.000. euros, on behalf of the Russian Owner, Alexander Nezhenets. Badgers Bloodstock bought Chiquita for 600.000 euros, @ Yearlings 2011 for Australian owner Paul Makin Chiquita has just won the Irish Oaks & came second at the Prix de Diane. See previous postings.